Terrariums — especially the adorable, miniature kind — have made a comeback over the last couple years. 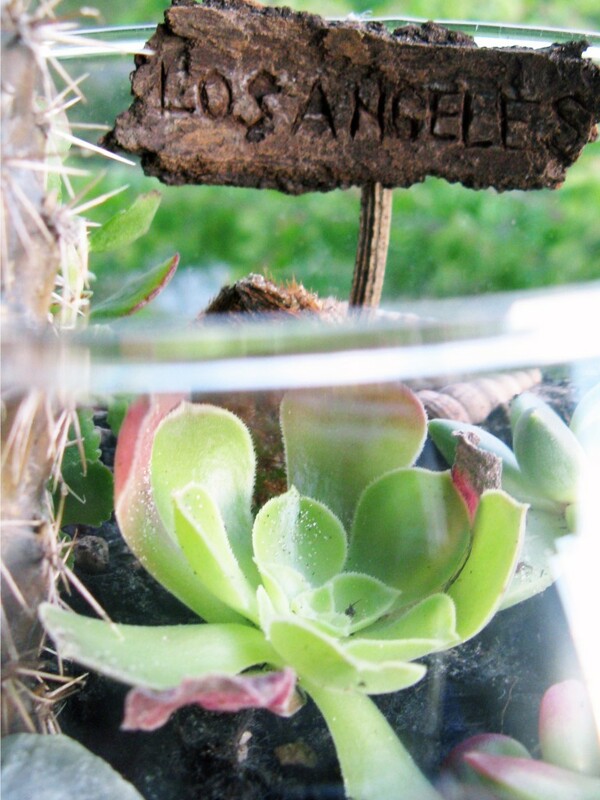 The simplest mini version is just turning a jar or dome over a tiny potted succulent. Instant cuteness! Mosses and air plants are popular, arranged in all sorts of interesting vessels, from lightbulbs to beakers. I tried an open succulent terrarium for a bit, before eventually moving the little stretching plants outside and into the warm sun they were so obviously craving. 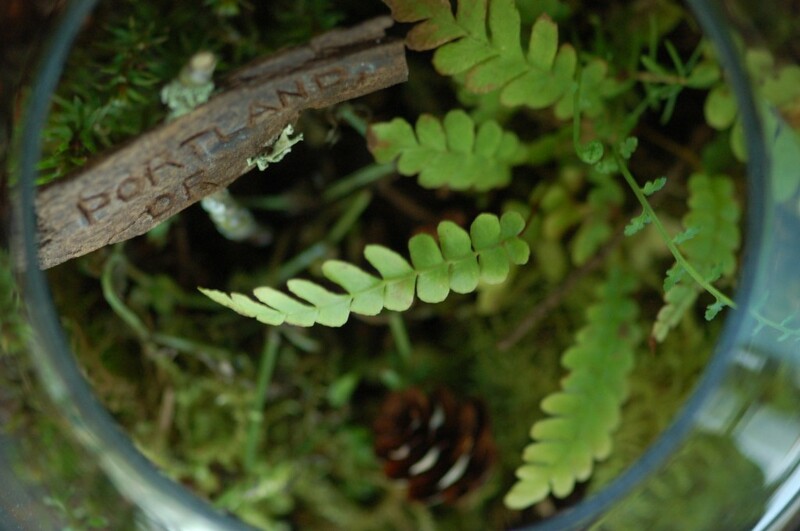 A recent trip to mossy, fuzzy Portland renewed my interest in tiny plant worlds — this time with a twist. What if the garden was actually a mini Stumptown? I collected a few mosses, ferns and pinecones in a tupperware container and brought them home to plant. I gave them a healthy base of pebbles, activated charcoal and potting soil and topped it all off with a carved Portland sign. A perfect souvenir! My trip to Portland was just one stop on an epic spring break — my brother and his fiancee joined me and Greg in Los Angeles for a few days of sightseeing, followed by a drive to and tour of San Francisco. It was from there that we headed north of California and into the forests of Oregon. 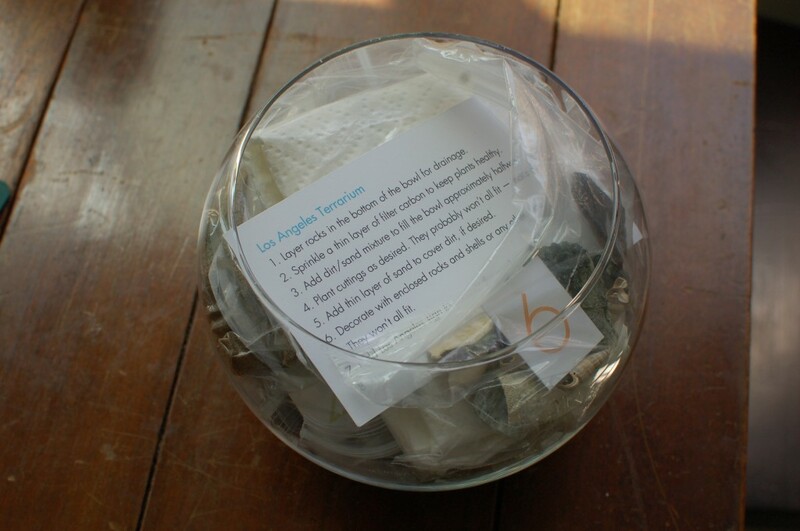 My terrarium has been the perfect way to remember our amazing trip, and I wanted to give the same to my brother. This is where the kit comes into play. 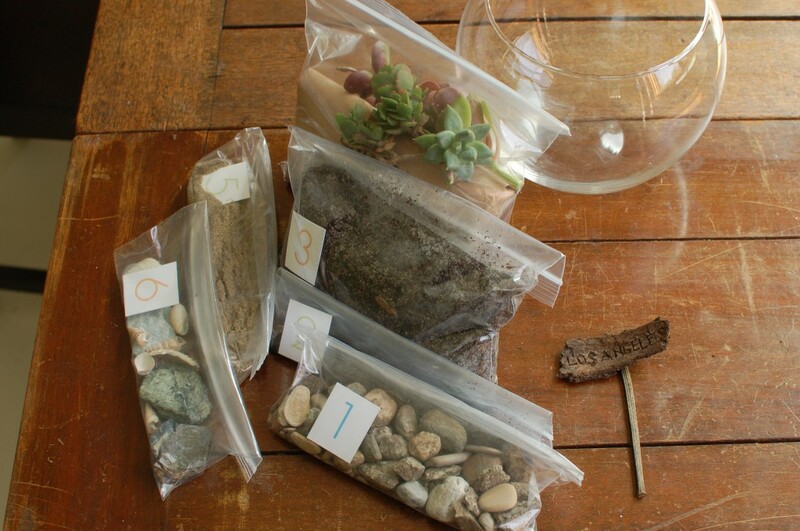 The gift terrarium would be Los Angeles-themed — mosses, soil and pinecones were replaced by succulents, sand and shells. I bagged and labeled the contents, with directions for proper re-assembly. The succulents were all cuttings from the plants in our yard, and since it’s usually best to wait a day or two before planting fresh cuttings (to seal the ends and prevent rot), they were fine in the mail. The terrarium would also serve as a display for the rocks and sea urchin shells that my brother collected during his time in LA. Again, the final touch was a carved sign. 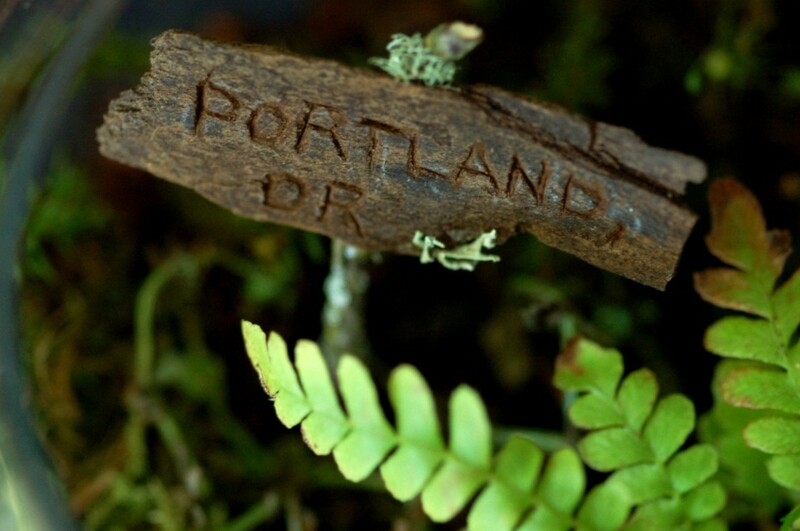 To make your own city sign, start with a piece of bark 1.5 to 2 inches long. Write the city name in pencil first, then carefully engrave the letters with an Xacto knife. I had to carve the word several times to make it legible. Once satisfied with the carving, use hot glue to attach a stick to the back of the bark. Has the fern stayed a good size? I would be afraid it would grow too big and takeover the space. The fern didn’t take over mine. I have more trouble with keeping water-loving plants alive and growing in our very dry climate! In my succulent terrarium, though, the plants grew too tall relatively quickly, stretching for the sun.